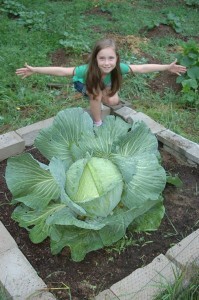 Lydia, the 2010 winner in Connecticut, sent in a great photo that shows the whole cabbage and all of her, too! We can only accept digital images. These may be taken on your mobile device or on a digital camera. Submissions may come from a 3rd Grade teacher. 4th Grade teachers can also submit winners (as students may have graduated to 4th Grade by the time their cabbage is harvested), but please also include the name of the student’s 3rd Grade teacher in the submission. If necessary, parents may submit entries for their children. When taking a digital image, include ALL of both the child and the cabbage in the image. Do not crop out any part of the child or cabbage. No bathing suits, please. Take the digital image when the cabbage is mature. Do not send an image of an immature cabbage. If sending a digital image from your phone or other mobile device, please send the largest size possible. Otherwise, submit a digital image with a resolution of 300 dpi, at a minimum of 4 x 6 inches. The file format must be .jpg. Please do not send PDFs or Word files! Teachers (or parents) should submit winning cabbages through our official online Submission Form.